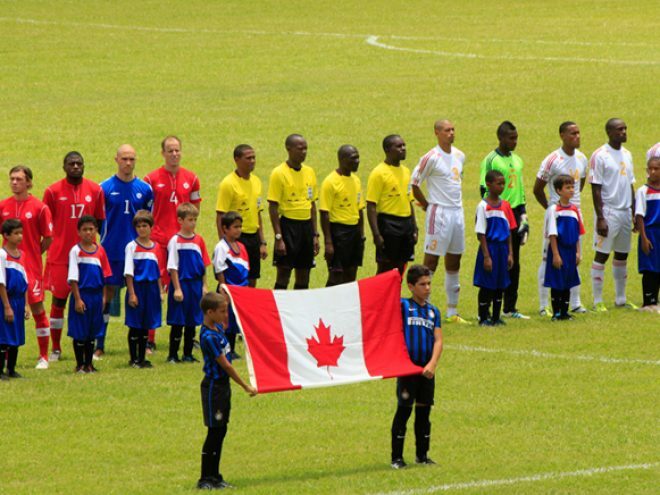 On Friday June 8, 2012, Cuba hosted Canada in a world cup-qualifying showdown of footballing minnows. Canada hasn’t qualified for the finals since 1986, while Cuba have to look all the way back to 1938. This match was billed as a must win between the two lowest ranked teams in the 4-team second round qualifying CONACAF group which also includes Honduras and Panama. The game kicked off at the Havana’s Pedro Marrero stadium at 2pm, which on a typically blisteringly hot June day, is an hour fit only for mad dogs and Englishmen. I get a sweat on simply watching the players warm up! The atmosphere in the stadium is boisterous and lively, there is some expectation from the Cuban side, always expectation, this could be England after all but with much more attractive supporters. At 5 cents a ticket this is a mite cheaper than a ticket at Stanford Bridge or Anfield, indeed you probably have to go back all the way to 1938 when tickets were that cheap in the UK! The main covered part of the stadium is actually cunningly designed with cold cement terracing proving a cool (ish) place to rest the weary limbs from watching the game. The pitch is surprisingly green and lush; to my mind it needs a trim. Even a barren dustbowl would have been preferable to a surface where the long grass saps the energy and limits the tempo. Cuba has something of a goal-scoring problem at present as Cuban forward Alain Cervantes explained in an interview with The Associated Press: ‘We have a solid team, but scoring goals is our pending task. We lack a killer instinct and skill at decisive moments, in part due to our lack of international experience…’ Who am I to disagree with the leading Cuban goal-scorer but it does bring to mind the thought of them practicing some basic movements. Having said that, Cuba look good bringing the ball out from the back, elegant players sweep the ball up-field, holding and carrying the ball with poise. It seems to take forever though and by the time they approach Canada’s penalty area the ideas factory seems to be running a little bare and the final ball lacks penetration. Canada on the other hand has a solid hard-working feel to them. Not much elegance here but competence mixed with typical Canadian toughness. Up front the Canadian strikers, Dwayne De Rosario and Olivier Ocean are in a different league from anyone else on the park. Quick, sharp and purposeful. It was Ocean who headed in a glorious cross from David Edgar in the 54th minute. Nine minutes later Cuba finally unsettle the Canadian defense with an insightful through-ball, that the Canadian keeper Hirschfield is forced to handle outside of his box, an infraction for which he is sent off. The Cuban supporters go wild as the red card is shown and chants of Cuba, Cuba, Cuba rang out, surely this is going to change the game, turn the tide. Once order is restored from the resulting pandemonium and Canada send up the substitute keeper Cuba is left with a dangerous opportunity on the edge of the area. Cervantes steps forward to strike the ball inanely over the bar and that is pretty much that. Canada actually seem to play better with 10 men, start to string passes together and look the more likely to score in the latter part of the game. Cuba work hard to bring the ball down the pitch only to let themselves down with the final ball, the final touch, the final shot. By the end there simply was not enough tempo on the Cuban side and as the final minutes tick by the Cuban crowd is even out-sung by a raucous and delighted small Canadian barmy army wrapped in Canadian flags who even had the cheek to shout out Ole, Ole, Ole as the Canadian team manages to string 22 passes together – perhaps a Canadian record. As the final whistle went the Canadian team are delighted to have eked out a 1-0 win while the Cubans are left with a must do better motif. The crowd seems accustomed to have been let down, they like football, they understand it and as every English armchair critic knows each and everyone has a strategy to improve the national team, if only they could do this, that, overlapping wingbacks, 3 center halves, shoot the ball, control the ball.